It occurred to me just before I sat down to write that people in my generation are the first to grow up not knowing what life was like before gaming (as we know it) was a thing. Being born between 1984 and 1990 when the NES reigned supreme over the gaming masses, those of us born in this era grew up with names like Mario, Link and Megaman as a constant throughout our lives. Just like us from the past, those born around the 2001 will never know of an age without the name Master Chief in their gaming vernacular. Or kids the were born in the mid-90s never knowing a time before the Internet in every household, or 2007-ish without a smartphone or tablet in your household. What’s important to remember is that while many game designers were around and developing games while we were growing up, there is a fresh generation of minds that have been exposed to a rich history of game design, good and bad. This might be an incestuous relationship because our ideas tend to be anchored to past experiences so our inspirations are “borrowed” from ideas that we’ve played in the past instead of coming up with something completely original. Regardless, our game-design parents and mentors helped to foster our experiences, our morals, our social dilemmas, our peaks and pits through our gaming experiences. 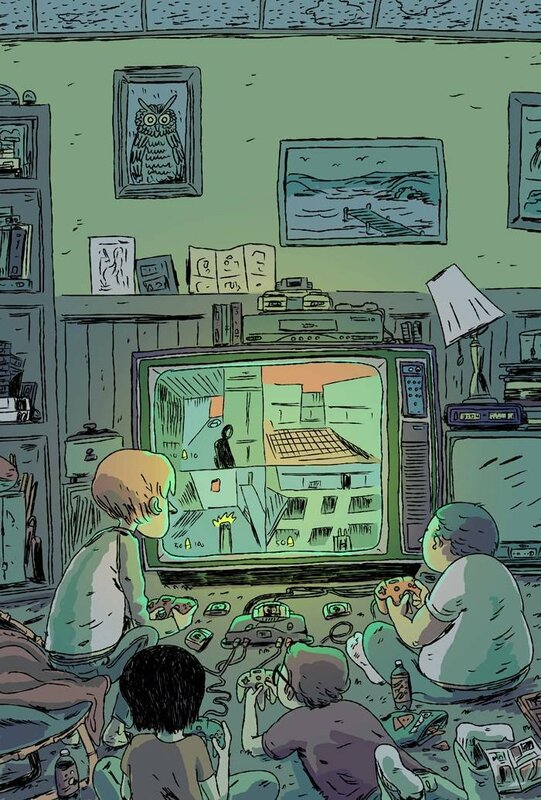 Our games were growing up while we were growing up. In the amount of time it takes to write this sentence, how many people are gaming at this time? There are currently 5 million users logged into steam, 300 thousand of which are playing DOTA 2, 150 thousand of which playing Counter-Strike: GO and 56 thousand of which playing Team Fortress 2, and 16.6 thousand still playing Counter-Strike Source. Doing a bit of math, we roughly have 500k players across just 4 games and mainly in just DOTA 2 and CS:GO. 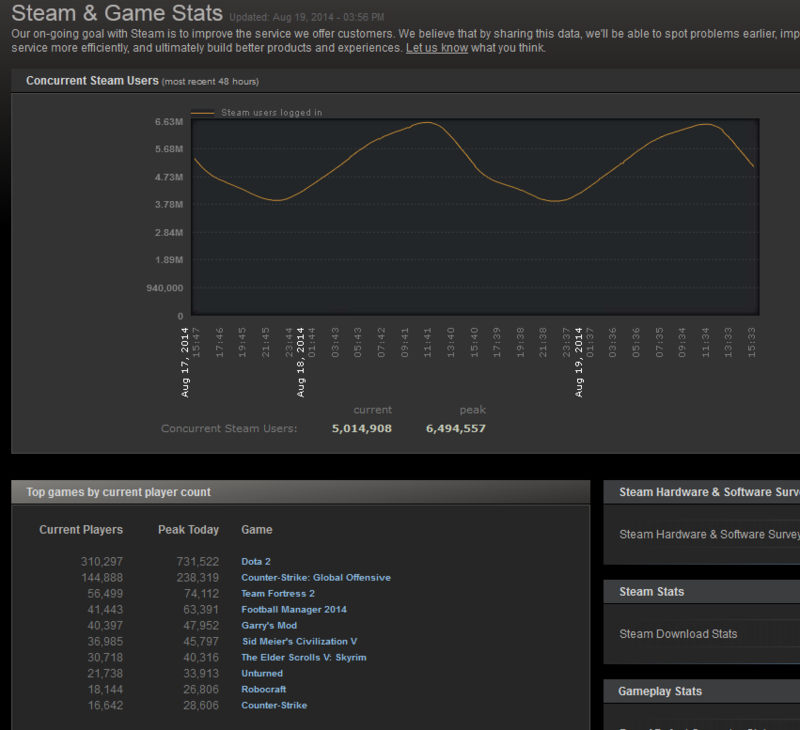 So, 10% of the Steam-PC gaming population is playing DOTA 2 and CS:GO at this moment. You mean I don’t even need to scrape the data to visualize it, but you do it for me? Thanks STEAM! If you’re a writer, then your hard drive will fail long before you ever fill it up. At 1000 words per hour, with each word being on average 6 letters, and chugging mouth loads of caffeine trying to write until your fingers whither and die, that means you’ll fill up a drive in roughly 3e8 hours or 38000 years. Considering the average lifespan of a hard drive is roughly 10 years, good luck writing. Thankfully, you don’t have to pass your Hard Drive off to the next 600 generations of offspring as their birthright to fill up the family hard drive with some sort of writing. Since they can’t actually go out and experience anything because of their need to type, it’s probably better off that they don’t write all day and night. You see this, son? This is what you’ll be doing when I die. Verbosity in games, much like any medium, is hard to get right. The dynamics of a game and the habits of a gamer are those that contribute a response towards quick reward systems. Run right and jump = Progression. Turn on console -> Start Game -> Join Game -> Start Killing things, all in a matter of a minute or two. But becoming programmed to this sort of habit goes against what verbosity tries to deliver. We’ve talked about how being verbose can be used correctly before, about not letting the mechanism for delivering the dialogue interfere with the agency of the player as they go about through the game. The delivery should only interfere when absolutely necessary but not for too long otherwise it pulls the player out from the immediate sense gratification that a game presents, but it means that shortened dialogue delivery needs to be discussed. When a character speaks, the player listens. When a character speaks too much, the player tunes out. Continuing with our look at Dialogue Delivery systems, we still need to look at when character-paced acting is mixed with dialogue as a means of delivering story, character development and plot points. The previous two can be found here and here which discuss Player-paced storytelling and character-paced dialogue-less storytelling, respectively. There are various means for pushing dialogue onto the player. Text-based, dialogue-based, interpretive gestures and symbols. I don’t want to focus too heavily on what they are actually delivering, but instead focus on how each will be received. Information delivery is important to think about when designing a game because you’re asking a lot of the player as they try and soak in the information presented. You’re dropping the player into a conversation among other people and expecting them to take the conversation as seriously as the other participants. If there is too much information, it becomes a chore to participate in the conversation.